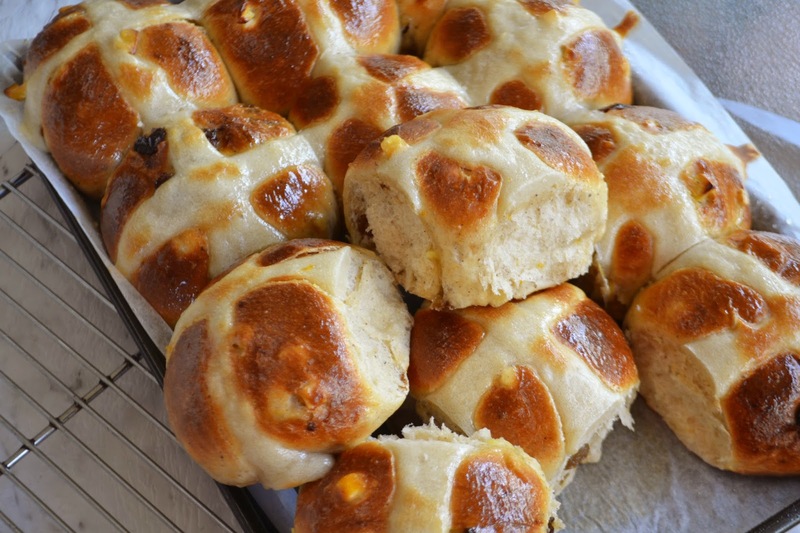 All The Little Extras: Better than yo' mama's Hot Cross Buns! I used a recipe from the bread messiah himself Paul Hollywood. It has the usual mixed peel, raisins and cinnamon in it but adds apple and a sweet apricot glaze. I added in vanilla beans and switched the glaze from apricot to orange marmalade. 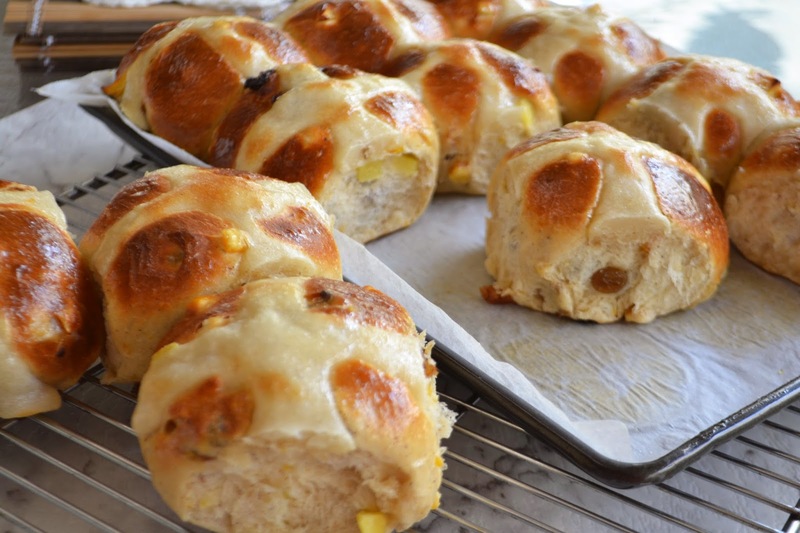 The buns have the gorgeously soft, tearaway edges that all awesome hot cross buns have. My crosses were a little too fat for my liking and that's because I snipped a little too much off the end of my piping bag. Whoops! You want to let these babies get nice and brown in the oven. The recipe has butter, eggs and milk in it do it's unlikely to get crusty unless you really forget about them so don't freak out and take them out too early. 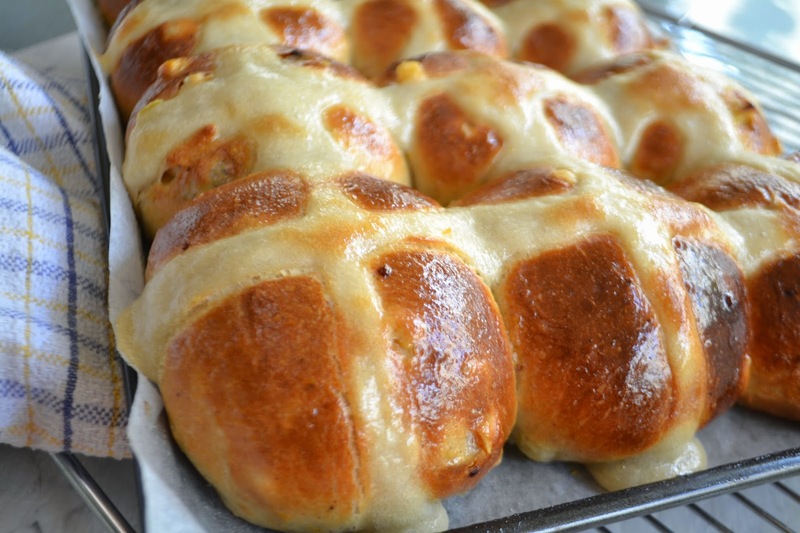 There's nothing worse than an anaemic looking hot cross bun! These buns are humungous! They come out of the oven all squishy and soft and are just begging for a slap of butter before being gobbled up whole. I added vanilla beans to the dough and used raisins rather than sultanas (the raisins seemed juicier but I don't think it makes a great deal of difference). I also used marmalade to glaze rather than apricot jam because who buys apricot jam, really? These beauties are also great served for breakfast the next day toasted and slathered in butter. First things first, place your milk in a pan and bring to the boil. Then turn off the heat and allow to cool down to body temp (37ºC-ish). Combine flour, sugar, salt, yeast, butter and egg in a bowl and slowly add the warm milk. I use the dough hook on my hand held electric mixer to combine these ingredients into a soft, sticky dough. Add in the raisins, mixed peel, zest, apple, cinnamon and vanilla and continue to knead with the electric mixer. Turn out onto a floured surface and knead by hand for another 5 minutes or until smooth and elastic. Form into a ball and place in an oiled bowl, cover with cling film and allow to rise in a warm place for 1 hour. Dough should have doubled in size after 1 hour. Turn out onto a floured surface again and divide into 12 even portions. Take each portion and form into a small, smooth ball. 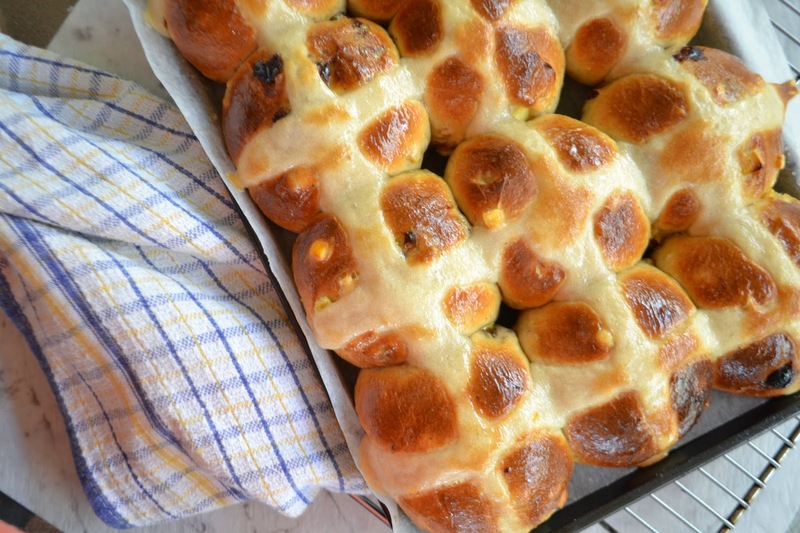 Arrange buns on a lined baking tray, leaving enough space that the buns touch slightly as they rise and expand. 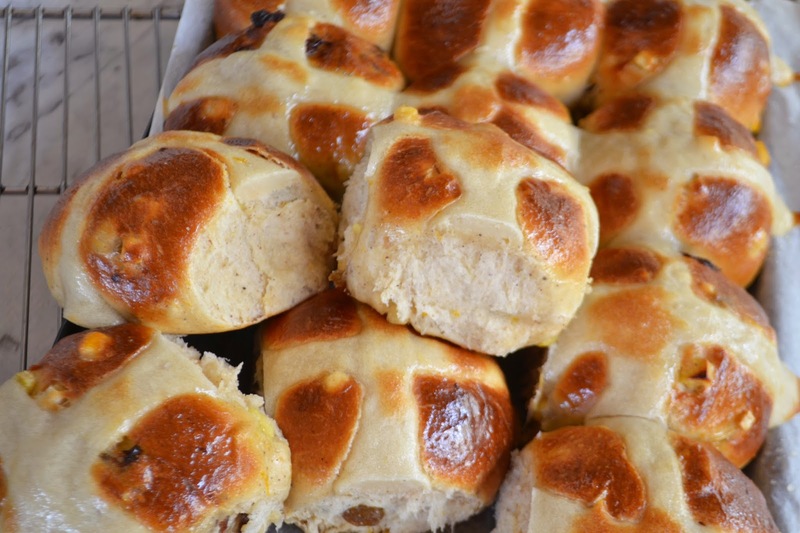 Set aside to prove in a warm spot for another hour or until buns have doubled in size. Heat oven to 220ºC. Take extra flour and water and mix to create a paste for the crosses. 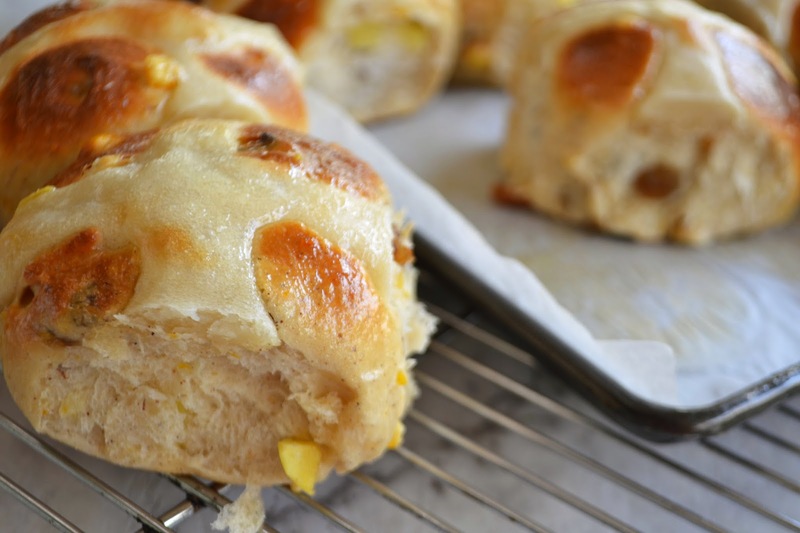 Place in a small ziplock bag and snip off the corner and pipe crosses on the proved buns. Bake for 20-25min or until golden brown. I also pour half a cup on boiling water onto a metal tray at the bottom of the oven to create a bit of steam which helps the buns rise up even more. Mix the orange marmalade with some hot water to create a glaze and brush over the hot buns before tearing apart and serving immediately!